That’s right. This crossword has audio clues. There is one mp3 file for “Across” clues, and one for “Down” clues. Your task, when listening to the very short clips from Beatles tunes, is to isolate and identify the particle verbs (otherwise known as phrasal verbs). These are multi-word verbs such as “let down”, “take your time”, and “find out.” “The particle verb will appear in the crossword exactly as sung by the Beatles. So for the verb “let down” you will write “DONTLETMEDOWN” – no spaces, no apostrophes. There are also written clues (see the Beatles Phrasal Verb Audio Handout below). Follow these clues carefully. If the written clue contains a subject and is in the past tense, like “I discovered the truth,” the answer in the puzzle will also contain a subject and be in the past: IFOUNDOUT. This allows students to explore how the verbs really function. If you want to do the crossword online, by yourself, just click on this link: Beatles Audio Crossword Online. This of course will give you the answers to. Listen to the mp3 audio files (below) and type in the missing particle verbs. If you click on the puzzle, you will also get a written clue for that word/phrase. If you want to do this activity in the classroom, you can use either of these worksheets. A Word document: Beatles Phrasal Verb Audio Crossword handout.doc or a printable PDF document: Beatles Phrasal Verbs Audio Crossword handout.pdf. If your class is advanced, with experience in particle verbs, you may let them try using the audio alone. Play the audio all the way through, first the across and then the down. If students have trouble, play the audios again. You may pause in between clues if you like. Each audio is just over one minute in length. I’ve add answers here too. Click on the little rectangle. This web is awesome…I was looking for ideas for my english class…thak you!!!! Wow! This is awesome! Great job, Kevin! Do you have the correct answers listed anywhere? This is just amazing! Thank you so much for sharing this innovative idea! I haven’t had the opportunity to use this great activity I think it is gonna be useful for my students I will try it and as soon as possible I get the results I will let you know. thanks for sharin this kind of ideas. Thanks a lot for posting this. Great idea! Hey, Ale. 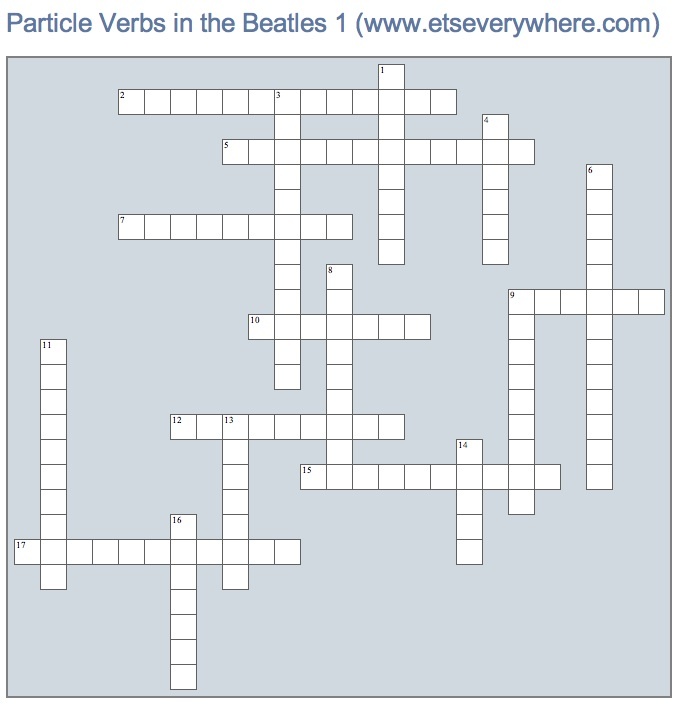 I think you should be able to download the Beatles crossword audio at http://www.etseverywhere.com/new/phrasal-verbs-in-the-beatles-an-audio-crossword. I’ve tested it and the files work. But let me know if you can’t and I will email them to you. This is an absolute great supplement for the classroom. It’s fun and the students learn simultaneously. Thanks! Thank you so much for this crossword. I admire your creativity in making this one. I really enjoy this exercise. I have a very problematic group and they will enjoy doing it. I think this game will help me with them. Thank you so much. This is sweet. I am going to use it with my advanced class tonight. great idea!! i want to use this crossword in my class this coming monday. would you send me the keys to my email!!??? please!? I just loved the idea, i’m using it today at my ESL class. Hey, Heber. Glad to be of service. Thank you so much for writing. I haven’t done anything new with English Teachers Everywhere for months. But letters like yours–even little ones–remind me that, yes, occasionally people do look at the web site. So thanks very much. What the heck is the answer to 9 down??? Hi, Robert. 9 Down is “work it out.” I’ve put the answers up now. Excellent idea! I´m teaching phrasal verbs and was looking for good songs to back up my teaching. Thanks a lot! Kevin, this is just brilliant! This is absolutely superb. Easily the best activity to teach phrasal verbs that I have ever found. Thank you very much. Great idea, Kevin. Thanks for taking the time to share. What a lovely task! Genius. Very nice of you to comment, Jo. I hope it isn’t too difficult. It probably takes students a bit of time. Thank you, Karen in Nicaragua. It’s great to know that English Teachers Everywhere is really for teachers everywhere. I myself am in Africa now. I’ve been teaching for a long time and I congratulate you on this brilliant idea. It genius. Thank you. I really should do more. Wish I didn’t have a job, Jamie! Thanks for responding.